Ruins at Cyrene, from livius.org. The Arab Spring has led to vast changes in many countries. Even Libya, long under the direction of Muammar Muhammad Abu Minyar al-Gaddafi, is now exploring its renewed future. Will the land, famous intellectual center of the ancient world that gave us the first map of the stars, once again find its leadership in charting the future? It was the relocation of Greek city-state Thera that brought fresh ideas to Libya. Might Libya once again find partnership with Greece as both nations explore new opportunities? CONSCRIPTION OR FIVE YEAR CONTRACT? Thera (modern Santorini) conscripted pioneers to find a new home for its people who were struggling to survive on their drought-besieged Greek island. Indeed, the conscription draft carried a penalty of death for those unwilling to go! But there was an escape clause. If the new settlement were not successful after five years, colonizers would be permitted to return home to reclaim their citizenship in Thera. The founding of Cyrene has its origins in mysticism. A pilgrimage to the oracle at Delphi resulted in the advice to found a new city in Libya. The advice was ignored for seven years during which time, according to Herodotus, “not a drop of rain fell in Thera.” All the trees on the island were killed, except one. A committee was appointed to go to the oracle, again. As smoke issued forth from the oracle, a voice hissed they must make a move, create a new settlement. This time, they listened. Map of North Africa with Cyrene, from Flinders University of South Australia at flanders.edu.au. Drought sent them forth, and water kept them in the new land. The Greek conscripts sailed to the coast of North Africa, where they were eventually led to a place where “the sky leaked through a hole in the heavens.” It rained often – glorious to the Therans. They established their new city-state, Cyrene, on the fertile highland ground in 631 BCE. Within 200 years, there were four more cities: Barce (Al Marj), Euhesperides (Benghazi), Teuchire (Tukrah), and Apollonia (Susah), the port for the Pentapolis. The five-city establishment was prosperous beyond many wildest dreams, legendary for its fine horses, abundant agriculture, and maritime trade. 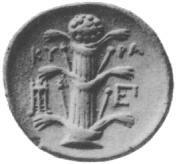 Silphium, depicted on a coin from Cyrene. Image: wikimedia commons. Curiously, Cyrene’s success may have been related to an herb. Silphium (or sylphium) grew only there, and was believed to enhance amatory powers. No wonder that this land’s inhabitants would espouse the Cyreanic school of philosophy, founded by Aristippus who lived in Cyrene from 435 to 356 BC. Aristippus suggested that the highest goal of life is pleasure. Cyrene flourished, founding a medical school, universities, erecting magnificent temples; some of the greatest architectural achievements of Hellenic style were built in Cyrene. Measurement of the earth’s circumference, mechanics of doubling a cube, research into prime numbers – these advances would not exist today if not for Eratosthenes, who was born in Cyrene. The mathematician was trained by Callimachus, second director of the Library of Alexandria. In 240 BCE, Eratosthenes succeeded his teacher in this role. Eratosthenes also drew one of the first maps of the stars (tallied at 675 at the time). Resolved by the Assembly: Since Apollo spontaneously told Battos and the Therans to colonize Cyrene, it has been decided by the Therans to send Battos off to Libya, as Archagetes and as King, with the therans to sail as his Companions. On equal and fair terms shall they sail according to family, with one son to be conscripted, and from the (other) Therans those who are free-born shall sail. If they (the colonists) establish the settlement, kinsmen who sail later to Libya shall be entitled to citizenship and offices and shall be allotted portions of the land which has no owner. But if they do not successfully establish the settlement and the Therans are incapable of giving it assistance, and they are pressed by hardship for five years, from that land shall they depart, without fear, to Thera, to their own property, and they shall be citizens. – From: E. Badian and Robert Sherk, eds. The Roman Empire: Augustus to Hadrian (Translated Documents of Greece and Rome). Cambridge: Cambridge University Press, 1988. 27,40, 224-26. Greece and Libya – Partners Once Again? : Both Greece and Libya are in the midst of significant change. Greece, as part of the European Union, is undergoing economic adjustments that may decide the future of its currency, its culture, and its role in the future of the region. At the same time, post-Gaddafi Libya is at a threshold. Are there potential cooperative opportunities for Greece and Libya that can be discerned through the success of Cyrene? Success Incubators: Cyrene may be one of the first Specialized Economic Zones (SEZ) or Intellectual “Incubators” in history. One might say that Cyrene was the Silicon Valley of its day, the Bell Labs of mathematics. It might be ventured that part of the success of Cyrene and the Pentapolis could be traced to the cross-cultural fertilization of Greeks and Libyans encountering each others’ world views. Most think-tanks are national, but is there something to be gained other models, including Cyrene? “Archaeological Site of Cyrene,” UNESCO, Decision 28COM 258.49. District of Ghebel Akhdar: N32 49 30 E21 51 30. “Cultural Sites in the Libyan Arab Jamahirlya,” World Heritage Centre, UNESCO, The World Heritage Newsletter, No. 9, December 1995. ISSN No. 1020-0622. “Eratosthenes of Cyrene,” by J.J. O’Connor and E.F. Robertson. School of Mathematics and Statistics, University of St. Andrews, Scotland. “Libya Cyrenaica and the Greeks,” The Library of Congress Country Studies. “Stolen Sculptures from Cyrene, Libya,” by Mark Rose. Archaeology: A publication of the Archaeological Institute of America, January 30, 2001. Http://www.archaeology.org/online/features/cyrene. “Cyrene and the Cyrenaica” by Jona Lendering. Http://www.livius.org/ct-cz/cyrenaica/cyrenaica.html.